Legal AI start-ups have tended to come from the UK, Canada, US and Western Europe, such as France and Germany. 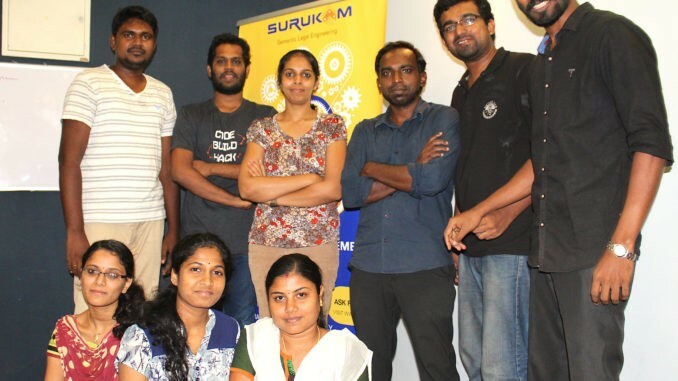 But now, say hello to Surukam, an AI-driven doc review start-up based in Chennai, South East India. The Surukam team (pictured above) has developed its own proprietary AI software called CruxIQ to handle tasks such as performing variation analysis from standard contract templates, as well as legal terms extraction, much as other legal AI companies have. In which case, you may say: ‘Great, but…?’ Yet, there’s a couple of reasons why this is interesting. The first is that as far as Artificial Lawyer is aware, this is the first legal AI doc review company to come directly out of India, a home to many technology companies and with a proud history of producing pioneering tech leaders. The second reason is that India is also one of the largest centres of LPOs and managed legal services in the world. In fact, one could say that India is a ‘centre of excellence’ for legal process management. A home-grown AI-driven document analysis company that could help to disrupt the LPO market in India, if not LPOs all over the world, is therefore potentially important. And perhaps third, India is a significant legal market, serving a nation of 1.3 billion people and a host of global companies from Tata to Infosys. And, it’s worth noting that one of India’s leading law firms, Cyril Amarchand Mangaldas this January announced it was working with Canadian legal AI company, Kira. This suggests there is at least some small appetite for change and adoption of legal AI in what is the seventh largest economy in the world. In the case of Surukam, the team in India is not waiting and has already taken steps to build a more global strategy. Most recently the team joined the MDR LAB start-up incubator of UK law firm, Mishcon de Reya in May. It’s also planning on setting up a formal presence in London. In part this appears to be in order to tap the already fast-developing demand for legal AI services in markets such as the US and UK. Also at present, the company appears to be focused on the inhouse legal market, with its technology pitched as taking doc review and contract management beyond the less advanced systems based on key words that still dominate large parts of the world’s legal sector. Can you tell the readers what Surukam does? Surukam provides an artificial intelligence based solution for automation of contract management, with minimal human intervention. Our platform CruxIQ – designed and developed by our AI and contract experts, based on the principle of predictive analysis, can assist in automation of contract extraction, redlining contracts, analyze contracts for any deviation from standard policies, flag such deviations based on the acceptance of such deviation by the organization. CruxIQ brings unimaginably automated and efficient contract management. I see you are using NLP? How does this play a role in what you do? NLP is a key part of what we do. We perform a linguistics driven analysis of the contract, as opposed to typical keyword driven approaches. You mention that you’re also making use of Machine Learning, how does this apply to your offering? We have taken a very different technological approach to this. We have deployed decision-making technology which is capable of learning while deciding. Our aim has been to leverage sequential prediction machine learning algorithms, while at the same time incorporating linguistics nuances to be able to build a truly intelligent platform. This enables an end user to customize Crux to their needs without any knowledge of AI/coding. Can you name any clients at the moment? It’s great to see a legal AI company in India. Is interest in legal AI growing among Indian lawyers and their clients? The Indian market is still at a very nascent stage for technology adoption, we primarily cater to US and European markets. Also, congrats on joining MDR LAB. Why have you joined and what do you hope to gain from this experience? We hope to be able to refine our product roadmap much better based on inputs from mentors at Mishcon. Last question: how long before you open an office in London? We plan to incorporate in UK by the end of this year. Thank you and look forward to hearing more about Surukam as you grow.